Several predictive biomarkers are currently approved or are under investigation for the selection of patients for checkpoint blockade. Tumor PD-L1 expression is used for stratification of non-small cell lung (NSCLC) patients, with tumor mutational burden (TMB) also being explored with promising results, and mismatch-repair deficiency is approved for tumor site-agnostic disease. While tumors with high PD-L1 expression, high TMB, or mismatch repair deficiency respond well to checkpoint blockade, tumors with lower PD-L1 expression, lower mutational burdens, or mismatch repair proficiency respond much less frequently. We studied two patients with unexpected responses to checkpoint blockade monotherapy: a patient with PD-L1-negative and low mutational burden NSCLC and one with mismatch repair proficient colorectal cancer (CRC), both of whom lack the biomarkers associated with response to checkpoint blockade, yet achieved durable clinical benefit. 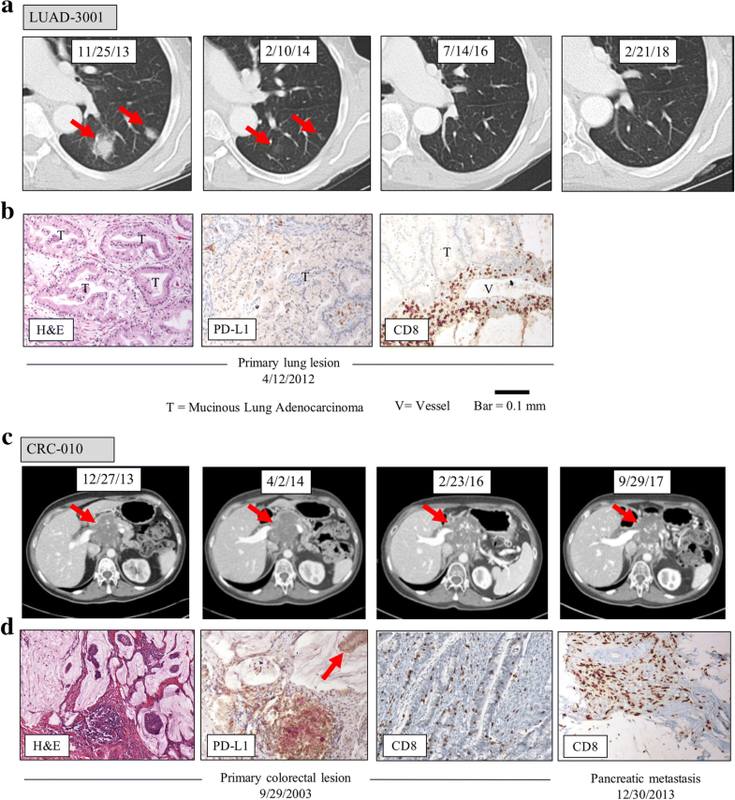 Both maintained T-cell responses in peripheral blood to oncogenic driver mutations – BRAF-N581I in the NSCLC and AKT1-E17K in the CRC – years after treatment initiation. Mutation-specific T cells were also found in the primary tumor and underwent dynamic perturbations in the periphery upon treatment. These findings suggest that T cell responses to oncogenic driver mutations may be more prevalent than previously appreciated and could be harnessed in immunotherapeutic treatment, particularly for patients who lack the traditional biomarkers associated with response. Comprehensive studies are warranted to further delineate additional predictive biomarkers and populations of patients who may benefit from checkpoint blockade. Expression of the ligand for PD-1, PD-L1, by tumor cells as well as detection of intratumoral microsatellite instability (MSI-H) were approved as inclusion criteria for anti-PD1 treatment of cancer patients. Clinical response to PD-1 blockade is much more frequent in patients whose tumors have a very high nonsynonymous tumor mutational burden (TMB) and consequent neoantigen expression [1–3], likely indicating the role of T-cells specific for mutation associated neoantigens in facilitating tumor regression. For example, mismatch repair deficient colorectal cancers (MMRd CRC, also MSI-H) which typically have > 1000 mutations per exome, have an inflamed tumor microenvironment and respond well to PD-1 pathway blockade. In contrast, metastatic mismatch repair proficient CRC (MMRp mCRC, also called microsatellite stable, MSS), which are characterized by a much lower mutational burden and an uninflamed tumor microenvironment , rarely respond to PD-1 pathway blockade . Similarly, in non-small cell lung cancer (NSCLC), high TMB cancers respond to checkpoint blockade at significantly higher frequency than those with low TMB [2, 3]. However, some patients without MMRd or high TMB cancers derive clinical benefit from PD-1 pathway blockade; understanding the basis for these outlier responses will provide potential biomarkers for therapeutic guidance and may provide insights into improving immunotherapy outcomes in patients whose cancers lack these biomarkers. Here we report two cases of patients with biomarker-negative tumors: a NSCLC patient whose tumor had 30 mutations and was negative for PD-L1 and a MMRp CRC patient, both of whom derived durable clinical benefit from PD-1 blockade monotherapy. Each patient maintained a T-cell response to a hotspot oncogenic mutation many years after treatment initiation: BRAF N581I [5, 6] in the NSCLC patient and AKT1 E17K [7, 8] in the CRC patient. These findings suggest that neoantigens derived from oncogenic driver mutations induce endogenous T-cell responses, which may be particularly efficacious in lower mutational burden tumors owing to the likelihood that oncogenic mutations are required for tumor survival. We evaluated two patients with tumors anticipated to be non-responsive to immunotherapy who derived durable clinical benefit and prolonged overall survival from anti-PD-1 therapy – both remain alive with ECOG-0 performance status years later. The first patient, LUAD-3001, is a 76-year-old woman who underwent a right lower lung lobectomy in 2012 for a T3 N0 well-to-moderately differentiated mucinous adenocarcinoma. Nine months after finishing adjuvant chemotherapy, three new lung nodules were found on surveillance imaging. Biopsy confirmed recurrent adenocarcinoma. The patient was enrolled on a clinical trial of single-agent nivolumab in December 2013 (NCT01454102), with therapy ongoing through the present. By July 2014, the metastases had completely disappeared, and complete response continues to be maintained for 4.5 years. Figure 1a shows LUAD-3001 CT before treatment, at first follow up, as well as 2.5 and 4 years after follow up. Whole exome sequencing revealed the patient’s tumor had 30 nonsynonymous exome mutations and was negative for ALK, EGFR, ROS1, and KRAS abnormalities. 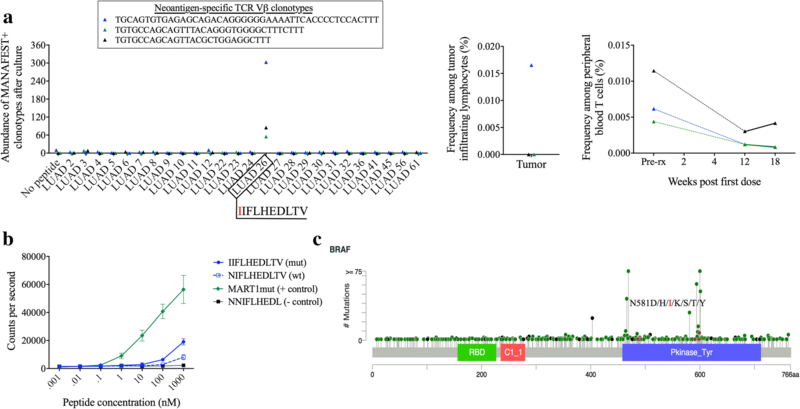 The tumor harbored an oncogenic BRAF N581I mutation [5, 6] (Additional file 1: Table S1). The tumor cells were negative for PD-L1 expression (Fig. 1b, center), though prominent perivascular lymphoid aggregates were PD-L1+. Immunophenotyping confirmed the presence of CD8+ T lymphocytes (Fig. 1b, right). The second patient, CRC-010, is a 69 year old woman initially diagnosed with a stage III mucinous right-sided colon adenocarcinoma. PD-L1 expression in her original primary tumor was observed at the interface of tumor and normal tissue and there was a dense CD8+ lymphocytic infiltrate (Fig. 1d). Staining for mismatch repair enzymes was normal, consistent with a mismatch repair proficient genotype. Whole exome sequencing of the primary lesion revealed 118 mutations, including oncogenic BRAF V600E and AKT1-E17K mutations. There were no mutations in any of the genes encoding mismatch repair proteins, KRAS or NRAS (Additional file 1: Table S1Table S2).Ten years after a right hemicolectomy, FOLFOX adjuvant therapy and FOLFIRI/cetuximab, she developed a pancreatic metastatic recurrence in 2013. The patient began pembrolizumab therapy in January 2014. CT scans in April 2014 showed disease stabilization. In May 2014, she discontinued pembrolizumab after 4 doses due to grade 3 serum pancreatic enzyme elevation. CT at the time showed stable disease with no new metastases (Fig. 1c). Following a course of chemoradiation with capecitabine, and then FOLFOX/Bevacizumab, she has not received further therapy since May 2015 and imaging studies continue to show a stable pancreatic mass with no new lesions (Fig. 1c). A fine needle aspiration biopsy of the pancreatic mass performed at the end of treatment in June 2015 demonstrated the presence of clusters of neoplastic cells compatible with residual moderately differentiated adenocarcinoma with mucinous features and a brisk infiltrate of CD8+ T-cells (Fig. 1d). The patients described in this study provided informed consent as approved by the IRB of Johns Hopkins. Patient LUAD-3001 was enrolled to CheckMate 012, a phase I study evaluating nivolumab combination therapy in subjects with stage IIIb/IV non-small cell lung cancer (NSCLC; clinicaltrials.gov, NCT01454102) and was treated with nivolumab monotherapy . Patient CRC-010 was enrolled to a phase II study of pembrolizumab treatment for metastatic colorectal cancer (CRC; clinicaltrials.gov, NCT018706511) . The samples used for each analysis in this study are detailed in Additional file 1: Table S1Table S3. Tissue specimens were stained with hematoxylin and eosin combination (H&E). Formalin-fixed paraffin embedded (FFPE) tissue sections were stained for CD8 (clone C8144B, Cell Marque, Rocklin, CA) and PD-L1 (clone E1L3N) as previously reported . Tumor and normal WES were compared to identify somatic alterations using the VariantDx software pipeline . Mutations from WES combined with each patient’s major histocompatibility complex class I haplotype were applied in the ImmunoSelect-R neoantigen prediction platform (Personal Genome Diagnostics) . This algorithm predicts the MHC class I binding potential of each somatic and wild-type peptide. Neoantigen candidates were further filtered by tumor-associated expression levels derived from TCGA to generate a final peptide ranking for experimental testing. Lollipop plots showing mutations detected in the BRAF and AKT1 genes were generated by cBioPortal [12, 13]. Binding assays were performed as previously described . We used the MANAFEST (Mutation Associated NeoAntigen Functional Expansion of Specific T-cells) assay  to evaluate T-cell responsiveness to mutation-associated neoantigens. Briefly, putative neoantigenic peptides defined by the ImmunoSelect-R pipeline (see above ; Additional file 1: Table S1Tables S4 and S5) were synthesized (Sigma-Aldrich) and used to stimulate T-cells in vitro for 10 days as previously described . T-cell receptor sequencing (TCRseq; Adaptive Biotechnologies)  was performed on individual peptide-stimulated T-cell cultures and T-cells cultured without peptide. Bioinformatic analysis of productive clones was performed to identify antigen-specific T-cell clonotypes meeting the following criteria: 1) significant expansion (Fisher’s exact test with Benjamini-Hochberg correction for FDR, p < 0.0001) compared to T-cells cultured without peptide, 2) significant expansion compared to every other peptide-stimulated culture (FDR < 0.0001), 3) an odds ratio > 5 compared to the “no peptide” control, 4) a minimum of 10 templates detected by TCRseq, and 5) reached a minimum baseline threshold to ensure adequate distribution among culture wells or was detected in a repeat stimulation experiment. TCRseq was also performed on DNA extracted from tumor tissue obtained from the primary surgical resection and serial peripheral blood samples where available. TCRseq was performed using the survey resolution ImmunoSEQ® platform for tissue and MANAFEST samples and deep resolution sequencing for peripheral blood samples . To determine if patients LUAD-3001 and CRC-010 had circulating T-cell clones that recognized tumor neoantigens and that were also present in the tumor, we used the MANAFEST assay , in which short-term cultures of peripheral blood T-cells with individual candidate mutation associated neoantigen peptides predicted by an HLA-I allele-specific algorithm are analyzed via T-cell receptor sequencing (TCRseq) . Twenty three out of 26 candidate neoantigenic peptides tested induced significant and specific clonotypic expansions of CD8+ T cells obtained from patient LUAD-3001 2 years after anti-PD-1 treatment initiation (Additional file 1: Table S1Table S6). Two of these neoantigens (a 10mer and an 11mer; LUAD 26 and LUAD 31) contained the oncogenic driver mutation BRAF N581I, a hotspot mutation previously reported to recurrently occur in melanoma and colorectal cancer [5, 6, 17]. The oncogenic mechanism underlying BRAF N581I is distinct from that of BRAF V600E in that N581I has diminished or inactive BRAF kinase activity but induces KRAS-dependent CRAF signaling and ERK activation . Three T-cell clones reactive with BRAF N581I recognized LUAD 26, a HLA-A*02:01-restricted epitope (IIFLHEDLTV; Fig. 2a, Additional file 1: Table S1Table S6); one of these clones was detected in the original primary tumor resection. All three of these clones were detected in peripheral blood T cells obtained prior to treatment, and were present at much lower frequency by 12 weeks after treatment initiation and after complete tumor regression. Although having seemingly poor binding affinity for HLA-A*02:01, LUAD 26 demonstrated improved binding kinetics relative to its wild-type counterpart (Fig. 2c). T cell recognition of hotspot BRAF mutations have previously been described [18, 19], but this is the first report of a T cell response against neoantigens derived from mutations at position 581. Remarkably, T-cell recognition of the BRAF N581I oncogenic driver and 22 additional mutation-associated neoantigens described herein (Additional file 1: Table S1Table S6) persisted years after complete tumor regression, thereby defining a preexisting and long-lived antitumor memory T-cell response. 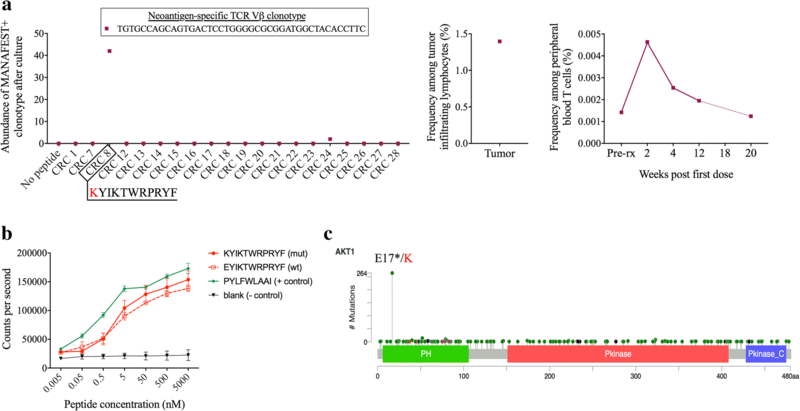 Similarly to patient LUAD-3001, we detected T cell reactivity to the oncogenic driver mutation, AKT1 E17K, in peripheral T cells obtained 3 years post-anti-PD-1 from patient CRC-010, a patient with MMRp mCRC. 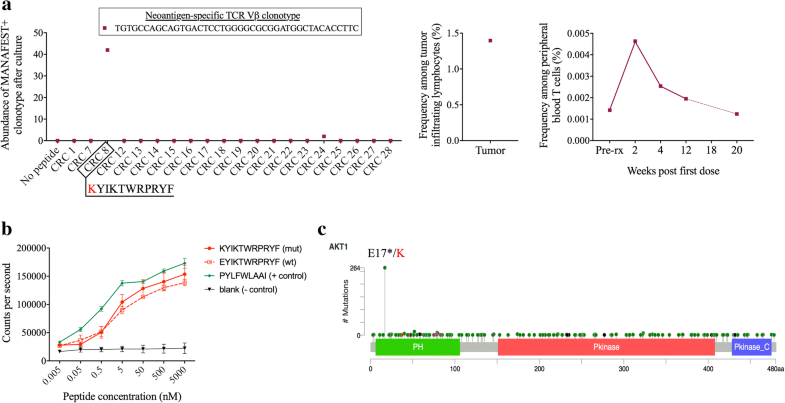 We identified two specifically recognized mutation-associated neoantigen peptides (Additional file 1: Table S1Table S6), including an AKT1 E17K – derived, HLA-A*23:01-restricted KYIKTWRPRYF peptide epitope (CRC 8) that induced a single expanded TCRVβ clonotype (Fig. 3a). This clone persisted in the periphery of the tumor-bearing patient as evidenced by its detection in a a subsequent blood sample collected ~one year later (data not shown). Strikingly, this single T-cell clone comprised 1.4% of tumor infiltrating lymphocytes detected in the original primary colon tumor of patient CRC-010 and underwent rapid expansion in the periphery upon PD-1 blockade before returning to pre-treatment frequency by 20 weeks post-treatment (Fig. 3a). This neoantigen demonstrated high affinity binding to A*23:01 in an in vitro assay, with similar binding kinetics observed in the wild-type peptide (Fig. 3b). The E17K mutation is a “hotspot” in AKT1, accounting for the majority of mutations causing constitutive activation of the kinase . These findings demonstrate that driver mutations may elicite efficient long-lived endogenous anti-tumor immune responses, and these responses may facilitate clinical response in patients treated with checkpoint blockade. On this note, adoptive transfer of T cells specific for hotspot driver oncogenic mutations, including CD8+ T cells specific for an HLA class I-restricted KRAS G12D epitope  and CD4+ T cells specific for an HLA class II-restricted BRAF V599E  or BRAF V600E  mutation have proven to derive clinical benefit. Here we provide further demonstration that endogenous memory T-cells targeting such oncogenic driver mutations can persist in the peripheral blood for many years after tumor clearance. Interestingly, the BRAF N581I-derived neoantigen demonstrated limited affinity for HLA-A*02:01 in our in vitro binding assay (Fig. 2b). Lower affinity epitopes (> 500 nM) are not uncommon [21–23] and in some instances binding to HLA might be subsequently enhanced by post-translational modifications . This is in contrast to the high affinity of the AKT1 E17K-derived neoantigen and its wild-type counterpart. In this case,the mutated amino acid is located at position 1 and therefore unlikely to affect binding to the MHC but may interfere with cognate TCR binding. The identification of immunogenic oncogene-derived neoantigens has profound clinical implications. In contrast to passenger mutations, driver oncogenic mutations are less likely to be eliminated by the tumor as a means of immune escape, since they are required for the transformed phenotype. Thus, sustained T cell responses against driver mutations likely are more productive for long term tumor control . New bioassays to detect and monitor the immune response to neoantigens, such as the MANAFEST assay used here, will help systematic screening for T-cell responses against tumor-specific mutations with a special emphasis on oncogenic driver mutations. In addition, the development of new assays that enable concurrent phenotypic profiling of neoantigen-specific T cell clonotypes will shed light on the effector function of these T cells. They may delineate a patient population that would not otherwise be predicted to respond to checkpoint blockade based on current biomarkers, such as tumor PD-L1 expression, high TMB, or mismatch repair status. While these findings do not provide evidence that the oncogene reactive T cells facilitated durable clinical benefit in these patients, they provide the foundation for further exploration of biomarkers likely to identify previously unappreciated populations of patients eligible for checkpoint blockade-based clinical trials. Indeed, patient LUAD-3001 would not currently be eligible to receive anti-PD-1 monotherapy as standard of care in the first line setting, as she did as part of CHECKMATE 012, and patient CRC-010 would not be eligible to receive anti-PD-1 at all. Additionally, identifying T cell clonotypes specific for these mutations provides the foundation for vaccines or T cell therapies targeting oncogene mutation-derived neoantigens in patients who did not mount these responses endogenously. High TMB, tumor PD-L1 expression, and MMR status being imperfect predictive biomarkers, new sensitive next generation sequencing methods, T-cell detection assays, and epitope prediction algorithms allow for the systematic screening of cancer patients for reactivity towards shared driver mutations, the detection of which could provide additional predictive value for clinical benefit to checkpoint blockade. Kellie N. Smith and Nicolas J. Llosa contributed equally to this work. A correction to this article is available online at https://doi.org/10.1186/s40425-019-0547-7. We would like to thank the patients and their families, as well as Lexa Hartman and other members of our respective clinical and laboratory research teams for their assistance with these studies. This work was supported by Bloomberg Philanthropies, the Swim Across America Laboratory at Johns Hopkins, the Lung Cancer Foundation of America and the International Association for the Study of Lung Cancer Foundation, LUNGevity, The V Foundation, The Mark Foundation for Cancer Research, NIH Gastrointestinal Specialized Programs of Research Excellence grant (SPORE; P50 CA062924) and NIH grants P30 DK089502, P30 CA006973, R01 CA203891, R01 CA121113, U10 CA180950, and T32 CA193145, the Commonwealth foundation, Cancer Research Institute/FightColorectalCancer, Merck, Bristol Myers Squibbb, a Stand Up to Cancer Immunology Dream Team Translational Research Grant (SU2C-AACR-DT1012), and the Colorectal Cancer Dream Team Translational Research Grant (SU2C-AACR-DT22–17). Stand Up to Cancer is a program of the Entertainment Industry Foundation. Research grants are administered by the American Association for Cancer Research, the scientific partner of SU2C. The patients described in this study provided written informed consent as approved by the IRB of Johns Hopkins. K.N.S., F.H., D.M.P, V.A., B.V., K.W.K., N.P., L.A.D, and V.E.V. have filed for patent protection on a subset of the technologies described herein (US provisional application no. 62/407,820). D.M.P. has ownership interest (including patents) in BMS, MedImmune/AstraZeneca, and Potenza, and is a consultant/advisory board member for BMS and MedImmune/AstraZeneca. V.E.V. has ownership interest (including patents) in Personal Genome Diagnostics and is a consultant/advisory board member for the same.